Our departure from Delhi was not until late evening, meaning that we had a full day of adventure ahead of us. S’s flight was even later than J’s and mine. So on the advice of the concierge at the Ashok Country House we decided the Red Fort was the appropriate destination. By now we had realized how little we really knew about the history of India so we were prepared for anything. But the Red Fort truly was like something out of the The Arabian Nights. We took an Uber (talk about creating a continuity of experience in any culture…) along beautiful boulevards, interspersed with crumbling shopfronts and people camped in every little open space. After 40 minutes, we arrived in Old Delhi, facing a long and high red brick wall that seemed to go on forever – especially in the 102 degree F heat. Now we had to find the entrance, which we presumed was somewhere behind the numerous military checkpoints. There were very few Westerners, and seemed to be no Americans at all. I located one European looking man in a pastel shirt who vaguely looked as if he knew what he was doing. We followed him up to the ticket counter and through even more checkpoints into the Red Fort itself. Once again, men and women were separated into two queues, so I proceeded along in solitary splendor as J and S veered off in a different direction until we’d gone through metal detectors, pat downs, and bag checks. The Red Fort was built in the 1600s by one of the Mogol sultans, and destroyed by the British. It’s now undergoing a major reconstruction. You enter through a large gate into an arcade filled with small shops selling everything from scarves to curios to jewelry. So overwhelming we didn’t even attempt to buy anything. You then arrive at the main campus, which I can only describe as Aladdin-like. A throne room for public audiences; a spectacular mosque with delicately inlaid red jeweled flowers on white marble. The whole area is about 2 kilometers in size. After several hours recreating the world of the sultans in our mind’s eye, we were ready to fortify ourselves with a 21st century lunch. I’d read about a Mogol restaurant that dated back to 1913 that was supposedly run by the descendants of a chef to the sultans. We tried to walk there from the Red Fort, through reams of people, beggars, salesmen, and just occupants of the city. We eventually figured out Google Maps was taking us in circles, and I was still dealing with a swollen and numb foot – so we swallowed our adventurers’ pride and hailed a motorized rickshaw type thing. I showed the driver the address on my phone, and along we went though narrow streets only to be dropped off at what appeared to be a literal hole in the wall, but turned out to be a warren of interconnected restaurants. Yes, it was a little Alice in Wonderland-like. To call it informal was an understatement. There was a sink at the entryway for washing up; we were then ushered up a short flight of stairs to a small and blessedly air conditioned room with five tables. Once again – we were the only westerners. I had mutton Muglai – a stew that was remarkably hard to eat with only a spoon and nothing to cut with. Plus, I felt so filthy by then that eating with my hands didn’t seem like a good idea – nor was I convinced that washing up with Delhi water was going to assist with any standard of cleanliness. Nonetheless, we managed. J had a superb chicken tandoori and S roasted mutton. Really good rice and nan and I don’t think a Coke has ever tasted so good as it did on that hot day. We were worried about getting back to the hotel in sufficient time to get our transfer to the airport especially given some of the challenges of getting around Delhi. We walked past a man carrying what was (at that point) a live rooster, spice shops, a live bird market – and miraculously were able to connect with our Uber driver. S still had his hotel room for another night (it turned out his flight left at 2 am that night, not 2 pm the next day as he had thought!) so we were able to shower off some of the grime from the 100 degree day before heading off for our flight to Dubai and then onto Orlando. We’d traveled up 20,000 feet by foot to get to the top of Stok Kangri. As our flight took off I looked out the window at the puffy clouds as we topped that height. Had I really climbed there, into that level of the stratosphere? I had–into that cotton, light, hard fought, rocky, grey and white, jagged, damp and dry, foot upon foot, part of the world. Usually you only see 20,000 feet from the window of a plane. But to reach that altitude on foot meant every inch had a special meaning. From the horses that carried our bags, their bells clanging as they looked toward their home villages, to the shrines with the yak skulls ashen in the hearths, to the rainbow colored prayer flags sending wishes into the winds….20,000 feet now evokes an infinite number of memories. It’s now the end of September and about two months since the wrap up of our Stok Kangri expedition. I’ve described much of the trip in a circular fashion – I started with the trek, the summit, and descent, returned to the acclimatization days in Leh when we first arrived – and now I’m the point to conclude with the trip’s real ending, our stay in Delhi. After the death march down Stok Kangri, one fell swoop from the summit to Base Camp to Stok Village, we ended up back at the Hotel Mogul in Leh at 10:30 pm, with a 4 am wake up call for a 5 am flight to Delhi on Go Air. We said good bye to our patient guide R, and were off to the airport, rejoined now by our three fellow trekkers who hadn’t made the summit attempt. So our ranks were back up to 10, if not the original 11. The flight over the snow covered mountain ranges was spectacular. Once in Delhi, we were met promptly and were back at the Ashok Country Resort by mid morning. After catching up on emails, we had lunch and then seven of us went off on the Delhi City Tour. Three of us had had enough and spent the afternoon touring various bars! Feeling scholarly, J, S and I took the tour route. Unfortunately I decided to wear shoes that seemed like a good idea at the time but turned out to be exactly what you shouldn’t wear following 21 hours of trekking. By the end of the day, my left foot was the size of a melon, and I’d managed to compress a nerve on the top of my left foot (an injury that is still plaguing me even today). That afternoon’s tour, led by a very enthusiastic tour guide, started with a trip to a monument, whose name I failed to memorialize, built by the Moguls atop a destroyed Hindu temple. The Moguls had defaced the eyes from the intricate Hindu carvings of men and women, but ironically, left intact their bodies, all carved into positions of the Kama Sutra. Next up was India Gate, a 20th century war monument. It operates as a free park for Indians and was packed with people picnicking in the red hot dirt, with very little grass. It was supposed to be the monsoon season, but the rains are getting later and later, and not a drop of water did we see. We finished up with a drive through the “White House” area of Delhi. This is where the British and Indian governmental officials lived. The dusty streets of Delhi suddenly shifted into something that all but resembled a gated community here in Florida. Wide, tree-lined boulevards with low slung white houses behind fortified walls. You could imagine the governmental elite, all drinking gin and tonics, oblivious to the world a quarter mile from their doorsteps. We made our way back to the hotel, where our own gin and tonics awaited by the pool. There was one last day ahead of us. The adventure to the Red Fort awaits. So this weekend has had enough unusual experiences to delay, yet again, my stories of Delhi. Because how often does one revisit activities that were very important in years gone by – and then push them forward into the future? That was this weekend. It started last week, when my long time Bikram yoga teacher Joe posted he was going to be teaching at a local studio on Friday afternoon, following his most recent trip to Australia. I hadn’t taken a Bikram class for at least 18 months. I left work early on Friday just to get there. And oh how I’d missed it! You talk about mindfulness. When you are in a Bikram class your entire mind and body is focused on following the dialogue and moving each muscle in accordance. There’s nothing else there but that moment in time, in the hot sticky sweaty spot that is an interstices between the then and the future – the now. The next day started with our raincheck horseback riding experience. 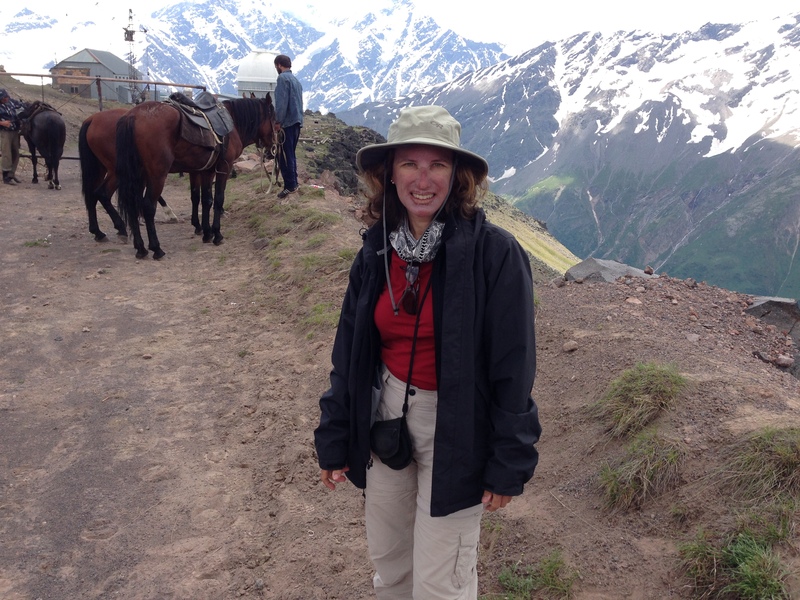 A few weeks ago, husband J and I realized we’d ridden horses – poorly and only on trail rides – in places ranging from Hawaii to the Caucasus Mountains, but never in Florida, where we’ve lived for the past 29 years or so. Time to change that. So we ventured off, a good 55 miles away, to Forever Florida, a combination cattle ranch and ecotourism preserve. There are zip lines, horseback riding, and lots of alligators. It’s truly a throwback to old Florida. Lots of the horses are Florida cracker horses who have to be DNA tested to show they really are descendants of those brought by Ponce deLeon. But the first date there was for a 2 pm ride. We should have known better. It’s Florida in the summer for heaven’s sake, in the days of global warming. We were totally rained out. Hence, our trip back yesterday on one of those beautiful Florida bluebird days – an azure sky decorated with white puffy clouds, like mounds of whipped cream splattered onto the sky. But what we didn’t know about the ride was that a lot of it was underwater – it was truly swamp. We went through multiple Florida ecosystems- prairie to slash pine forest to palm hammock – and into the Bull Creek slough. That’s where my very short horse and I got quite wet – water up to my thighs and his chest. 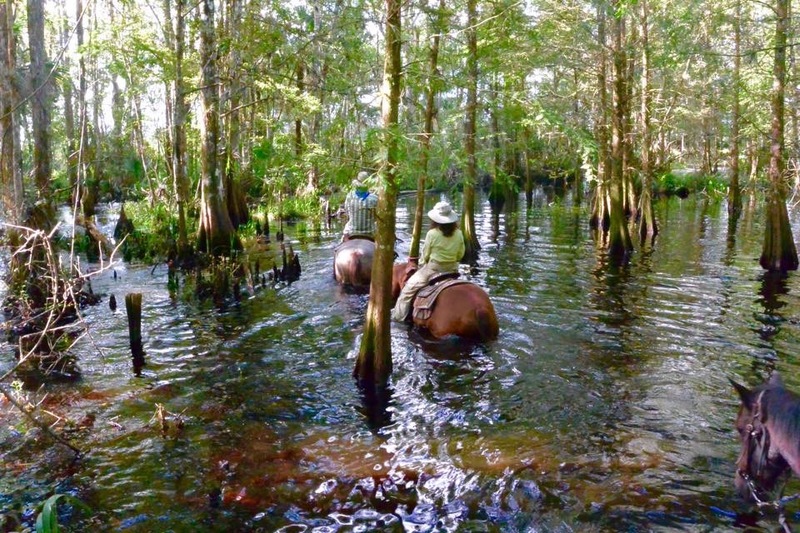 I suppose I could have pulled my feet out of the stirrups and pulled them up high as others did – but I felt a lot more balanced staying in the stirrups – and frankly, the dank brown water felt remarkably refreshing in the 90 percent humidity. It wasn’t that hot – but, boy, it was humid. That was Saturday. Sunday was supposed to just be my regular – as in 15 years or so regular – 2 pm yoga class at the Downtown Y. But as I walked in, I was told that teacher E (she’s ok) had just gotten into a car accident and wouldn’t make it and there was no instructor but we could have the space. So I was going to practice regardless – about 20 of us were still there and someone asked if I would lead the class. So I did. We all got into a circle (or a version thereof) because I didn’t feel qualified to act as though I were a teacher and somehow a circle is less authoritarian. But I must say – the dialogue from my Bikram class on Friday and the many years of yoga kicked in and I was amazed at how natural and good it felt to lead a class. Not sure how everyone else felt but I’m hoping it was ok. I’ve frequently considered taking teacher training but most recently have thought I should just recognize I’ll only be a participant. But now I’m wondering if my initial instinct was right – and I really should do the teacher training. Some food for thought on a Sunday. Pretty wild weekend of revisits and moving forwards. Namaste. The first night in Leh – our night’s sleep was punctuated by the sounds of very loud people in the hotel courtyard, followed by a heavy rain storm and a cacophony of barking dogs. I quit trying to sleep at 5:30 a.m. Breakfast finally started at 7:30 – eggs to order, poori, chick peas and corn. That day, Tuesday, our second in Leh, Ladakh, involved a two hour drive along winding roads cutting through the mountains and following the river to the Alchi Monastery. A few villages along the way but the main outposts of civilization seemed to be multiple military bases. The oldest parts of the monastery were 1000 years old, and show Mogol influences – before conversion to Islam. Our guide R gave an interesting description of his brand of Mahayana Buddhism. We had a typical lunch at a restaurant at the monastery – cheese in red sauce, potato curry, dahl, local vegetables. Along the way was the remarkable view of the Indus River merging into another – the Crest toothpaste like blue into the murky brown. Especially notable were the carved signs of the road construction companies advertising their work. After we returned from the monastery we had some down time until 5:30, when we met up with R for a short acclimatization walk to the big stupa at the edge of town. After a climb up 500 stairs, we were rewarded with a great view. And to reward ourselves further we ventured to “Food Planet,” a roof top bar where people who weren’t worried about their VO2 levels could order hookahs. Wednesday started off on a sad note as one of our trekkers, V, encountered some medical issues that resulted in his having to return to the UK. And two others, M and M, were off at the doctors for colds! A bit daunted by the early reduction in our ranks, we took off on yet another acclimatization hike. Wove through crowded streets and alleyways by very large houses, many of which were under construction. Because of the weather, construction can occur only during the summer months. Spent quite a while watching the outdoor assembly at an elementary school. Finally we broke from the road and went up a very steep trail, with switchbacks up to the top of an over 13,000 foot mountain. There are so many such peaks here they don’t even bother to name them. I was steady but definitely the slowest – felt the altitude a bit. We were going rapidly and I felt I did ok. There were actually two summits with some fun scrambling in between. And coming downhill was great. These early hikes are so odd – you can tell the guide is continuously evaluating you- not just to make sure you’re ok at the moment but to get a sense of how you’ll do when you are really at altitude and facing the summit and whether you’re ready. We re-entered Leh by the 16th century Ladakh palace. A very plain, large fortified structure now empty. The current “king” of Ladakh – who no longer has any official status – is still alive and lives in a nearby village. Stripped of power but apparently not money. That afternoon J and had our one splurge and purchased an old, intricate kilim (woven rug). It tells a story – you can see where the weaver started to run out of wool and and misjudged the layout of certain motifs. One more day in Leh before our trek was to begin….and a day we’d all been looking forward to – a drive to the second highest drivable pass in the world. I was sitting in the front (motion sickness doesn’t improve with altitude). Many Indian tourists who had no acclimatization at all on motorcycles heading up to the pass. And many T-shirts promoting it as the highest drivable pass in the world – with lots of motorcycle graphics. The higher we got the more hairpin turns there were and the less the visibility. I simply didn’t look out the window for large parts of it. The pass was highly militarized and we had to show our passports to move forward, even though we were still in the same country. We also learned that satellite phones and detailed maps were completely banned in this part of India. So much for my rescue plan at the summit. We were now at 17,500 feet and it was freezing with light snow. I was grateful I’d dressed warmly and had my hiking poles – those who hadn’t were pretty miserable. After we stopped we struggled up a nearby hill – quite icy and couldn’t go as high as planned because it was simply too slippery. But what was near the top was a small hut, lots of burning incense – and an oracle – a woman in a purple and yellow shirt dancing around the hut screaming and chanting. It turned out the day was a holy day – the one time a year that the oracle – from a local village – comes to this spot. Other villagers were there to light the butter lamps and pay appropriate homage. I think C from our trip has video. If he reads this he should add it to the comments. After a very quick tea at the crowded small tea house – where most were huddling to stay out of the cold – we drive back down through a steady rain that only occasionally cleared. Once back, we had a delicious lunch of momos (dumplings) and listened to R give our trek briefing for the next day. J and I went back to town to pick up some last minute things – amidst the pouring rain in what was supposed to be the dry season. In the meantime, S had somehow managed to run into a rabbi doing evangelical work in Leh. He got into a conversation about the synagogue his wife attended in Alaska and ended up with a dinner invitation for 10 pm at night. He may be the only American/Alaskan to experience a Lubavitch Jewish dinner in Northwestern India. Just another example of the unexpected things that can happen in Ladakh. The next day – the true Odyssey started. The one to Stok Kangri- where I started this series – Days 1/2 – The Stok Kangri, Ladakh, India Expedition. But there’s still more left- after the trek, Base Camp, the summit and the Death March down – there was still our stay in Delhi. That awaits.